In the process of building a shooting range, perhaps the most intimidating part is getting it approved by your local government. Even after you’ve done all the work, raised all the money, and planned everything out, the final say still comes down to a handful of elected officials. Don’t let that make you feel powerless, though. Even if the ultimate decision is in someone else’s hands, there are still things you can do to increase your chances of success. Your local government officials need to know as soon as possible that you’re planning to build a shooting range. They’ll appreciate it if you inform them early and often of your intentions, and that communication can open doors for you later on. You’ll have a much better chance of getting your range approved if you’ve established a relationship with local leaders from the beginning. Early communication will also help you figure out zoning issues. In most cases, land has to be zoned as either commercial or industrial for a shooting range to be built on it. Find out first thing if the land you’re looking at is zoned appropriately. Zoning requirements for building a shooting range vary depending on where you live, and some places may not even have specific guidelines for ranges. Your local officials will have the most accurate information and can help you understand the requirements. Should you discover that the land you plan to build on is not zoned appropriately for a shooting range, ask the planning and zoning committee if it can be re-zoned. Often, city governments are willing to work with local businesses on zoning issues to keep potential commerce from going elsewhere. The more you know about what’s required to get your range approved, the better. Become familiar with local noise and firearms regulations as well as environmental restrictions that will apply to your shooting range. How will you handle noise abatement? How will you dispose of lead? How will you keep customers and employees safe? All of these issues will come up when presenting to the city council. If you already know what their concerns are by asking questions and doing research, you can adequately prepare to answer them. Once you know what standards you’re shooting range will be required to meet, talk to an Action Target territory manager to find out what options are available. Action Target specializes in building state-of-the-art shooting ranges and offers several technologies to meet the stringent requirements of government regulations. For example, Action Target’s Total Containment Trap (TCT) is the most environmentally-friendly bullet trap in the industry and makes lead containment safe and easy. With the addition of a Screw Conveyor System (SCS), all bullets and range debris are safely collected and deposited into a sealed barrel for convenient disposal. Action Target also provides sound-abating safety baffles, acoustically-rated wall systems that reduce reverberation by 98%, bullet-proof transparent lane dividers, and ventilation systems that filter air and protect customers from lead exposure. No matter what regulation your shooting range is under, chances are Action Target has a patented technology to meet it. Once you’ve talked to your local government officials and learned everything you need to know about regulations and restrictions, all that’s left to do is present your plan to the city council. For those inexperienced in public speaking, this may be the scariest part of the whole process. To make the experience smoother, ask a city council member in advance what information they want from you, write down a list of questions they may ask you, and prepare all of your answers ahead of time so you don’t forget in the heat of the moment. If you feel like you need additional backup, Action Target representatives are more than willing to attend the city council meeting with you no matter where you live. That way you can have a shooting range expert standing next to you to answer any questions about the technology and safety features of your future range. The sales team at Action Target is willing to do whatever it can to make the approval process as seamless and successful as possible for you. If you have any questions or concerns about getting your shooting range approved, call Action Target at (801) 377-8033 and ask to speak with your area representative. And be sure to check out our Build Your Range tool by clicking here. Please note, the tips included in this message have been found to be helpful for many clients throughout the years, but may not apply in all situations. Please use judgment in determining which tips will be helpful in your particular situation. This article was originally published in the Action Target Journal on June 14, 2012. Everybody has their own preference when it comes to shooting ranges. Some people like the open-air feel of an outdoor range where they can shoot steel targets at 500 yards while others prefer the air conditioned comfort of indoor ranges where target distance can be controlled with the push of a button. Both have pros and cons and there’s not necessarily a right or wrong answer, but there are some things you need to consider before building a range to make sure you are providing your future customers with what they want and need. To better help you in the decision making process, here are some pros and cons for both outdoor and indoor shooting ranges. And be sure to try out our Build Your Range tool. Outdoor ranges generally require less expensive equipment. An outdoor shooting range can be as simple as a shooting line and a dirt backdrop or as complex as a law enforcement proving ground with moving targets and realistic tactical simulations. Either way, the equipment you need for an outdoor range will probably be less expensive than an indoor range because you don’t need a building to house it in. Outdoor ranges can provide a greater range of shooting with appropriate berms. While indoor ranges are generally limited to shooting straight ahead from a fixed position, outdoor ranges allow shooters to participate in tactical training with up to 180 degrees of firing mobility. The more flexibility your range offers, the more realistic your training scenarios will be. In addition to increased firing mobility, outdoor ranges also allow for greater tactical training freedom. Training at an outdoor range can include multiple firing stations, a greater range of distance, vehicle scenarios, and terrain-based exercises. With an outdoor range, you are less limited in the ammo you can use. While indoor ranges are sometimes restricted to bullets within a certain muzzle velocity and bullet type, most outdoor shooting ranges are virtually unrestricted. Some outdoor ranges are even capable of handling incendiary rounds and artillery fire. While training of this kind may not be necessary or even desirable at your range, the capability is available. Outdoor ranges can also more safely accommodate shooting steel targets. Building an outdoor range requires expensive earthwork and soil engineering. Not all sites are immediately suitable for an outdoor shooting range and may require extensive excavation to ensure bullet containment. The less suitable the site, the more money you will have to spend to make sure the backdrop and containment systems meet federal regulations and local statutes. You also may have to bring in power, water, and sewage hook ups from a long distance away, thus increasing the cost and adding to the needed infrastructure of roads, parking lots, and other development. Due to the open-air nature of outdoor ranges, however, complete bullet containment is usually impractical due to expense. This is why location is such an important element in the building of an outdoor range. Outdoor shooting ranges must be built in an area where an errant shot that goes over the backstop is incapable of doing damage; this is referred to as Surface Danger Zone (SDZ). This can require building the range in a remote area far from the city, and being far from civilization means your customers are going to have to travel a longer distance to use the range. It is inherently difficult to contain lead and noise at an outdoor range, and as housing encroaches on formerly uninhabited areas, more and more outdoor shooting ranges are being shut down. While the location of your outdoor range may seem safe from housing development, conditions can quickly change and endanger the future of your range. You must try to plan for variables that could affect your outdoor range in the long term future. Because indoor ranges can easily be built in the middle of cities, they are much more convenient for customers. For commercial ranges, that means increased visibility and accessibility. For law enforcement, that means a cut in overtime costs for police departments because officers don’t have to travel as far as they would to train at an outdoor range. They can also easily train during inclement weather conditions that would be more difficult on an outdoor range. Technological improvements are making indoor ranges a more viable option for tactical training. Ballistic doors can allow vehicles to enter the range for training scenarios, lighting can be adjusted to simulate daylight and low light situations, sound effects can be played over the loud speakers to induce stress or simulate a combat environment, and bullet traps like the Total Containment Trap from Action Target allow for increased flexibility in shooting across firing lanes or at moving targets. For commercial ranges, an indoor shooting range can provide a significant retail avenue. When combined with a retail firearm and an ammunition store, indoor ranges can be highly profitable ventures. Customers are more likely to buy ammo at the range where they shoot and are more likely to buy a gun if there is an opportunity to try it out on a shooting range first. Indoor shooting ranges are more expensive to build and require a building to house them. For an indoor range you need to either build a new building from scratch or find a building that meets municipal requirements for parking, sound, and zoning that can be properly retrofitted to house an indoor range. 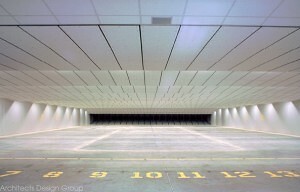 Indoor shooting ranges also often require a target retrieval system, ceiling baffles, fully ballistic walls, bullet traps, a ventilation system, and lighting. All together, the equipment and facility costs can greatly exceed that of an outdoor range. Indoor ranges are sometimes limited in the caliber and type of bullet that can be fired, depending on the range equipment chosen. The use of old or home-made bullet traps and the increased risk of ricochet that comes with an indoor shooting range naturally limits shooting capabilities. While modern bullet traps provided by Action Target can handle up to .50 BMG, many older indoor ranges cannot allow the use rifle calibers because their old range equipment designs will not safely stop rifle rounds. Because of size and sound constraints, some ranges don’t allow rifle shooting at all. 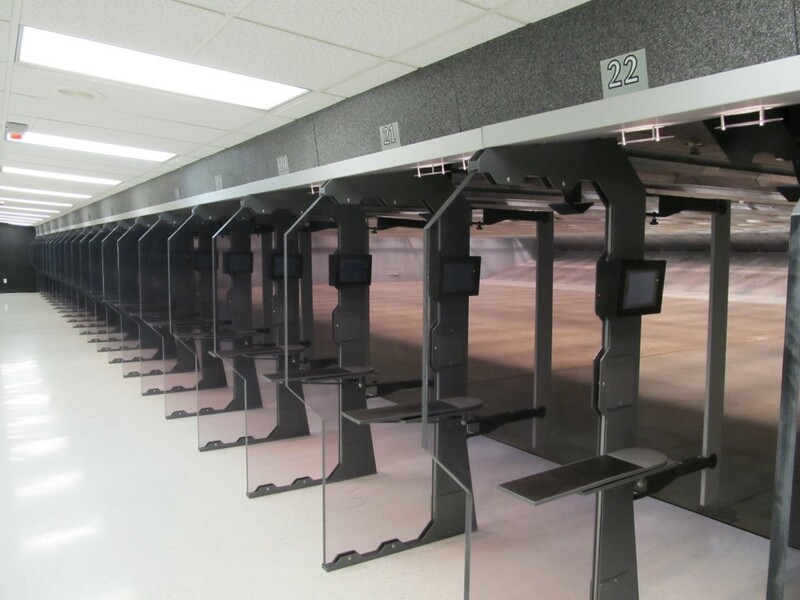 Indoor ranges also require costly range ventilation systems to meet OSHA and EPA requirements. For the health of yourself and your future customers, I should mention that your typical local HVAC contractor usually cannot properly design and install the type of system required for a clean and safe indoor range that I would shoot in with my own family. Ask your ventilation contractor how many indoor range ventilation systems they have designed and also ask them what design criteria is required to meet OSHA and EPA requirements. If they cannot guarantee that their system will meet these requirements, you might be making a costly mistake. Whether you are deciding to build an indoor or an outdoor range, I recommend you contact the Action Target representative in your region and they will be happy to answer any questions you have and will help you determine what type of range and what equipment will best fit your needs and budget. They build hundreds of new ranges every year and will be able to draw on their vast experience and resources to help advise you with your project. Follow this link to try our tool to Build Your Range and get a quote! A range is a business. Despite the fact that many people end up turning range operation into a humanitarian effort by working more than 90 hours a week, it must be remembered that most people chose to run a range for the purpose of financial gain. Similarly, the goal for most facilities is to be profitable. However, this is always more difficult to execute than it initially seems. This causes us to ask the question: how can a range raise more of a return on investment? First off, it must be remembered that the range exists as the profit center to the business. Secondly, a decision needs to be made in regards to the operations of the range. In regard to the commercial value of a range, there are typically two lines of thought in the industry: one is to combine the range with the store, and the second is to not. If one were to do the simple math of operating a range, the numbers would not point to a viable business plan with the proper rate of return. In contrast, an indoor range working in conjunction with a properly operated store has the ability to produce a significant return on investment and be of great value. A quick example might be helpful to understand this line of thought. A client comes into the range store and has a desire to purchase a gun for self-defense. Not being familiar with different firearms, the employee in the store can offer consultation and recommendations as to what might be the best choice. Now, if the store were equipped with a shooting range, it would be very easy to take this client onto the range with two or three different guns and to let them have some practical experience to aid in the sale. After the client has first-hand experience with each of the choices, it is much easier to properly guide the clients to make the best choice for their set of circumstances and needs. Using this small example above, it is easy to see how a range really does have the ability to turn a good store into a great store. This is not a question of price—this is a question of service. The ability to serve the client does matter. While true that today’s marketplace faces the challenge of customers being able to access a limitless amount of information online, in this market, the store that provides a quality service will always prevail. “If you build it, they will come.” It is always the hope that this adage will prove to be true, and oftentimes ranges are built under that assumption. However, those who run the range must remember that the business plan is the most important thing to take care of because it is what makes sure there is money coming into the register when people visit their range. Whatever programs are initiated for the facility, remember: there must always be a return on investment. For more help in making your range economically viable and to increase your return on investment, contact your Action Target Territory Manager.